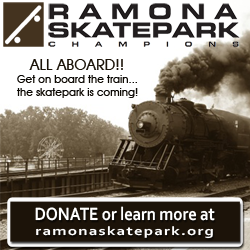 There is so much to do in Old Town Ramona. Every week, local stores have a variety of events, from a mini-Doctor Who convention to yoga, Zumba and dancing, poetry, book signings, paint-your-own pottery classes, and special sales, concerts and entertainment. Coming up on Saturday, April 25, Old Town merchants are hosting a special Meet the Merchant Day and Sidewalk Sale. This will be the perfect opportunity to stroll around Ramona’s original shopping district and show your family and friends the best of our town. In addition, a “Where’s Waldo?” scavenger hunt, scheduled for July, is sure to bring out the detectives in all. While new businesses are popping up all over town, Old Town Ramona has seen amazing growth in the last few years. More new stores have opened, and many businesses have been spruced up with new paint, signs and siding. While antiques have always been a draw for flatlanders and tourists, shopping, entertainment and dining are bringing in more new people each day. Quaint shops with books, clothing, antiques and art have visitors stopping to walk the around the Old Town neighborhood every weekend. Not only have the tourists found a renewed interest in Main Street, but many locals have, too. During the holidays, stores stayed open late and decorated their windows. Many area residents discovered that they could do all of their holiday shopping in Ramona. This event, coupled with the “shop small” movement, seemed to breathe new life into our historic district. Since then, local shoppers have been coming out in larger numbers. Recently, the “Old Town Ramona” Facebook page ran a game where people posted items that could be found only by shopping in Old Town. Participants discovered that there is a yarn store, bookstore, clothing store, florist, local craft shop, coffee shop, theater, art supply store, art gallery, natural food store, thrift shop, feed store, multiple salons and spas, several workout studios, and, of course, seven unique antique and resale shops. Sprinkled between restaurants and other businesses, each one of these places is a locally owned or family-run business. It’s clear that there is no need to shop down the hill when you can find quality, unique gifts right in our own town.